The best unofficial Seattle's Best site on the web! Holiday Drinks at SBC - Candy Cane Mochas and Gingerbread Lattes - Frozen or hot! I thought I'd write a bit about the holiday drinks available at Seattle's Best Coffee right now. (Seattle's Best Coffee is fully owned and operated by Starbucks Coffee Company). I flew out of town over the Thanksgiving holiday time frame, and dropped by a Seattle's Best Coffee at Sea-Tac Airport. There, I tried the frozen Gingerbread Latte. It's definitely pretty to look at and comes with cute little mini gingerbread men sprinkled on the whipped cream. Even though this looks like a great drink, it wasn't that great. 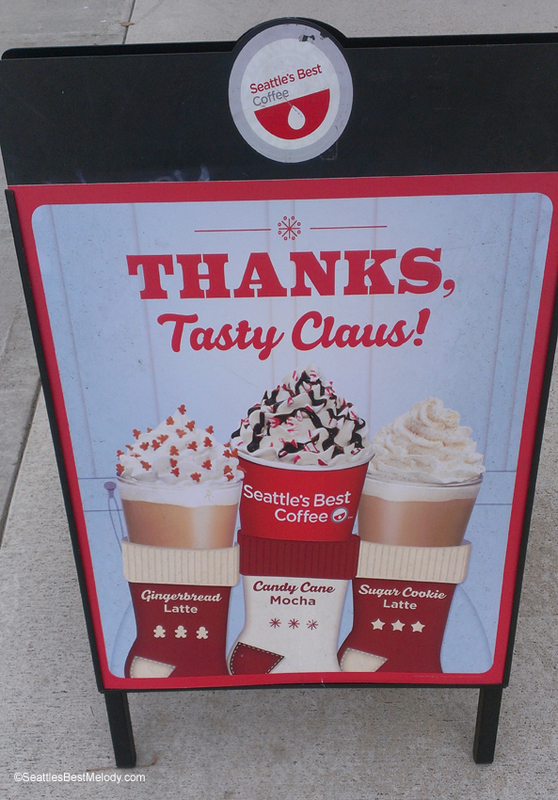 It was very sugary, and didn't have some of the fun spiced flavors of the Starbucks version of the Gingerbread Latte. While that beverage wasn't my favorite, I loved the peppermint bark shown above. I wish Starbucks offered that same peppermint brownie! Then, just yesterday (on December 10th), I had occasion to drop by the Seattle's Best Coffee in the SODO neighborhood of Seattle. I immediately thought it was very cute how SBC had made it look like their little drive-through only store was adorned with a bow and ribbon. 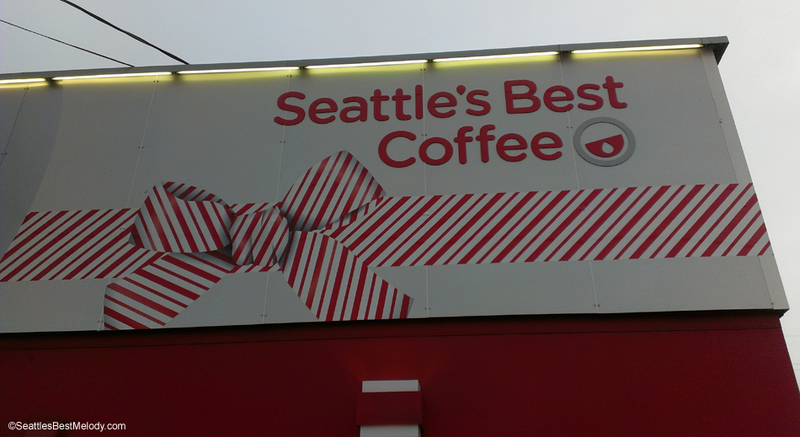 While visiting this drive-thru SBC, I decided to try the frozen Candy Cane Mocha, also a seasonal holiday beverage available now at Seattle's Best Coffee. It has a nice minty flavor, and I like that the whipped cream comes with little tiny pieces of candy canes on it. The candy cane topping was delicious! The mint wasn't too sugary, and had a nice complementary flavor to the candy cane topping. ^ I definitely give that two thumbs up, and would order it again. In case you're wondering, here's the signage for the holiday drinks. (Again, the photos were taken at the SBC drive thru). Hope you enjoyed this quick trip to SBC! Welcome to SeattlesBestMelody.com! Melody is an attorney in Seattle who has a passion for coffee. My first blog is StarbucksMelody.com, which is my primary blogging project. I decided that I wanted to have a place to talk about Seattle's Best Coffee, which is owned by Starbucks. This site is an archive. Please visit Starbucks Melody for my most current blog posts.